Experience a true taste of Portland, Maine's rich Colonial history at the historic Tate House Museum. 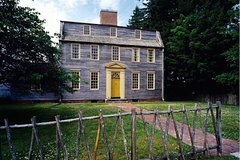 The Tate House is the only pre-Revolutionary home in Greater Portland that is open to the public. On this 1-hour tour, see the impressive period furnishings, beautiful grounds, herb gardens, and unique architecture that offers an insightful glimpse at the 18th-century and life in Colonial Maine. Tours of the home and grounds are offered hourly and led by a local guide. The historic Tate House was constructed for Captain George Tate and his family in 1755. The Tate family had arrived in the Colonies around 1750, while Tate served as the Senior Mast Agent for the British Royal Navy, overseeing the cutting and shipping of white pines from Maine to England. This position assured Tate's success, and his status in the community is reflected by the style of architecture he selected for his home. With its clapboards still unpainted, Tate House is one of two residences in Maine with an unusual subsumed dormer in the gambrel roof. As the only pre-Revolutionary home in Greater Portland that is open to the public, the impressive period furnishings, beautiful grounds, herb gardens, and unique architecture of the Tate House offer an insightful glimpse at the 18th century and life in Colonial Maine. Hourly tours are led by experienced docents who will lead the way through one of the true gems of Maine's colonial history.